Why did you enroll in Integrated Science? 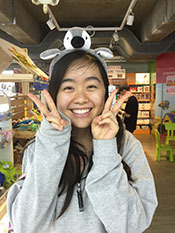 I chose to try out ISC because I was indecisive about what to study in college, but I had an interest in physics and other quantitative sciences, so taking ISC seemed like it might offer a nice sampling of different fields in science to help me decide. Overall, ISC was challenging but rewarding, and most importantly, it gave me many opportunities that are unique to ISC students. The course covered a very large range of topics, but the instructors always found ways to connect the various topics back to common mathematical themes. To me, seeing the relationships and dependencies between fields that are usually taught independently, like chemistry, biology and physics, made studying each one of those topics more interesting. This also made the assignments and exams very challenging, and the course required the majority of my time and effort. However, the difficulty of the course that motivated me to work with my peers constantly, which created a uniquely tight-knit community. In addition, ISC's small class size and custom-made curriculum gave me the opportunity to get to know several professors and instructors quite well. Another part of ISC that was important to me was the lab component. ISC labs are by far the most well-designed, meaningful, and educational labs I've ever encountered as part of a class, especially in contrast to the generally-boring labs offered by most 100-level physics courses. The lab instructors always tried to tie in ISC labs to much bigger topics, and the actual experimental procedures were very involved. And though lab reports required a lot of time and were often sources of frustration, we ultimately got much more valuable skills from them (matlab, latex) than we could have from just answering a few questions at the end of a lab period and calling that a "lab report." ISC's biggest impact was to show me how deeply interconnected all the scientific fields are. Seeing these connections made me more interested in pursuing a more interdisciplinary field of study, like biophysics or bioinformatics, especially since I still find it difficult to decide on just one topic to study. How do you like working with the various integrated science faculty and staff? I loved working with all of the ISC faculty and staff. We had lectures by 7 different professors. They came from the physics, genetics, chemistry, and biology departments. And this isn't even counting the lectures we got for computer science (which would make the total 8 professors). The professors are amazing resources, not only because they are so eager to help students understand the lectures, but also because they are living breathing examples of what a future in any scientific field might look like. There are also awesome preceptors and special tutors who come in just so that you can bother them with questions and befriend them. What is it like going through Integrated Science with a close cohort of student peers? The ISC community is very tight because you spend so much time together in class and lab, not to mention outside of class, working on assignments. To be honest, my social life freshman year was basically my ISC classmates and my hallmates. Another cool thing is that the upperclassmen who have survived ISC are really involved with tutoring and mentoring the freshmen. Some of them get paid to be there for hours to answer questions and be a resource in whatever way is needed. I got to know quite a few awesome upperclassmen this way that I probably never would have met otherwise. This is a unique experience, and one that is built into the ISC experience.